Barnes, Steven. Lion's Blood . Warner 2002. What if: Socrates refused to commit suicide and instead fled Athens for Egypt. Two centuries later, Egypt and Carthage united to destroy Rome, and in time the Egyptian-Abyssinian empire came to dominate Africa and Europe. 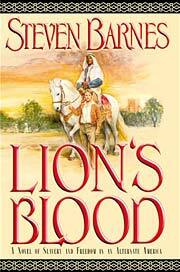 Series note: A two-volume series including Lion's Blood and Zulu Heart . Summary: More than 2000 years after Socrates, an Irish boy is sold into slavery on a plantation in New Djibouti, near the Aztec border in Bilalistan. Although he nominally becomes a friend of the owner's son, there is always something to remind him that he is no more than property. Series note: First volume of Insh'Allah. Published: Warner 2002 (0446526681w88 android), 2003 (0446612219BUY). Barnes, Steven. 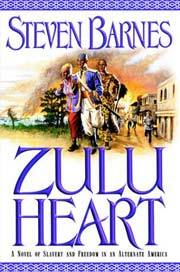 Zulu Heart . Warner 2003. Summary: Set three years after the events of Lion's Blood . Series note: Second volume of Insh'Allah. Published: Warner 2003 (0446531227w88 androidBUY), 2004 (0446611956BUY).